While thinking about death is not something most people like to do, it is an inevitable part of life. Planning for end-of-life care choices today by preparing an advance directive will reduce the burden put on loved ones in the future and will ensure your end of life wishes are honored in the event you are unable to make the decisions on your own. An Advance Directive is a written, legal document regarding your preferences for medical care should you become unable to make medical decisions for yourself. 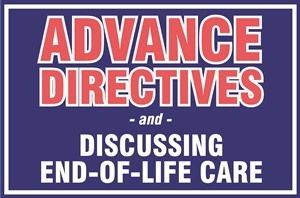 Advance Directives serve as a guide for doctors and caregivers if you are seriously injured, terminally ill, in a coma or near the end of your life. They usually consist of two types of legal documents; Power of Attorney and a Living Will. A Living Will is a legal document that specifically states medical treatments you would and would not like to receive in order to sustain your life should you become permanently unconscious or terminally ill, for example. A Medical Power of Attorney is a type of Advance Directive that appoints a health care agent to make decisions on your behalf when you are unable to do so. This person is usually a spouse, but can be a family member, close friend or any other person who you feel will make sure your wishes are met to your expectations. Creating an Advance Directive puts you in charge when it comes to decisions about your medical treatment even when you’re no longer able to make those decisions. 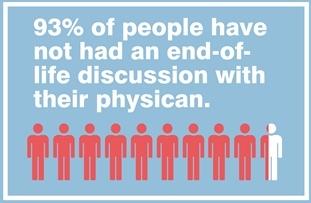 It is almost impossible to know what a dying persons wishes are unless they’ve been discussed beforehand. Advance Directives take the un-necessary decision making burdens off your loved ones and allows them to devote their energy to compassion and care. 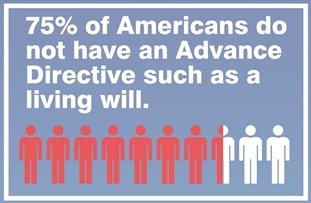 There are numerous resources available to help you complete your advance directive. You do not need a lawyer to do so and can find forms and instructions from various locations including local hospitals and hospice programs, public health departments, your state healthcare association website or by visiting www.agingwithdignity.org to order an Advance Directive form called “Five Wishes”. Once your Advance Directive is written, it is important to discuss and give a copy of your wishes to your Physician, Family and Friends. Your physician is most likely the one who will be caring for you when the directive becomes relevant and will more likely honor requests that have been communicated to him/her directly. 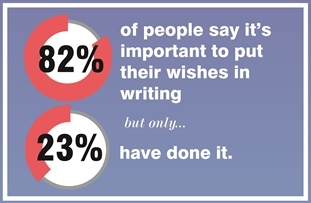 When you discuss your wishes with family and friends they will likely have an easier time recollecting your requests and will be less likely to confuse your intentions with their own.